If you’ve ever thought one vote couldn’t make a difference, you might want to reconsider that this election year. 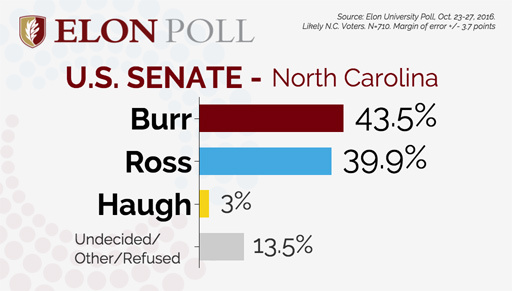 The latest polling by Elon University finds that the presidential and gubernatorial races are simply too close to call, while the U.S. Senate contest favors Richard Burr, but remains within the margin of error. Look for then undecided to be the determining factor for this Senate seat – that’s 13.5% of those surveyed in this poll. Down ballot, Democrat Roy Cooper is holding the thinnest of leads over incumbent Republican Pat McCrory in the North Carolina’s governor’s race. Husser says count on this one being “a nail-biter” until the bitter end. 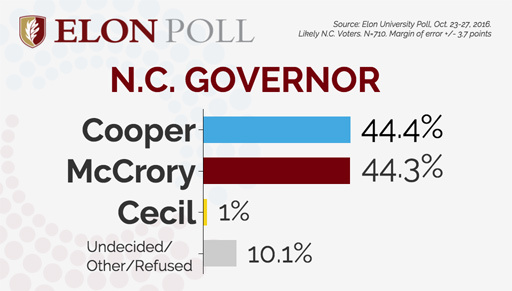 Cooper continues to show solid support among black voters, with 91 percent planning to vote for him, while 63 percent of white voters support McCrory. And it’s worth noting, only a small portion of voters plan to split their tickets, with 94 percent of Clinton supporters planning to vote for Cooper, and 96 percent of Trump voters supporting McCrory. If you want to vote ahead of election day, remember that early voting lasts until mid-day Saturday, November 5th. Find local early voting sites here. 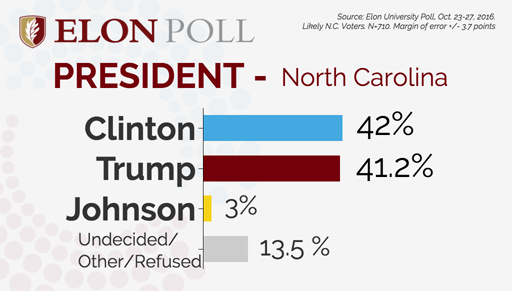 To see all the questions and crosstabs for the latest Elon University poll, click here.